The Seven Summits is a group of the tallest peaks on each of the seven continents. It sounds pretty simple, but there’s a lack of conclusive agreement on what constitutes a continent. For example, if Australia is a continent, then where does New Zealand live? And if Europe and Asia are one land mass (Eurasia), how do you draw a line between the two? Once faced with these questions, you soon realize that naming the Seven Summits and tallest peaks on the planet are far from straightforward. To some people, this is a pointless argument. To others, it’s core to their life mission. Either way, I enjoyed finding out what the fuss was all about. We have 7 Continents, right? Most credible dictionaries name Australia as a continent. But let me ask you a question: Should the total of all seven continents include all countries on Earth? The definitions in most encyclopedias suggest that some island countries have no continental home. Countries like Greenland, Cuba, and of course, New Zealand. So let’s say we decide that all countries deserve a continental home. That means our definition of a continent should probably relate to land masses or tectonic plates. All of this contention results in the following common definitions of the Seven Summits. You’ll notice that neither follows the strict tectonic plate definition (only the continental mass, and, continental mass + islands definitions). 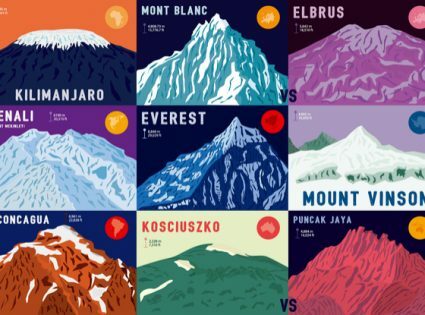 From this list, we can see why there’s contention over whether the highest peak in Oceania is Mt Kosciuszko (Australia), Carstensz Pyramid (Indonesia/New Guinea), or even Mt Wilhelm (Papua New Guinea). The first peak is on the Australian continent, the second is on the border of the Indo-Australian plate, and the third is on the extended version of the Australian continent. Most of the mountaineering fraternity agree that Carstensz Pyramid is the logical Seventh Summit. However, if you go strictly by tectonic plates, then Mt Everest is the highest peak on the Eurasian plate and Mt Elbrus misses out. But those same traditionalists still cite Mt Elbrus as one of the Seven Summits. So it seems there’s a third definition of a continent, which isn’t a tectonic plate or a continental mass, but a combination of the two. That is a continental mass including its satellite islands. If you’ve reached this far in my findings, chances are that you too are secretly enamored with/of the Seven Summits. After all, it really is a silly argument in the scheme of things (such as world poverty, the meaning of life, etc). But if you mix science, mountaineering, strong opinions and travel, you’ll certainly get my attention. I’d love to hear your thoughts, opinions or comments below.